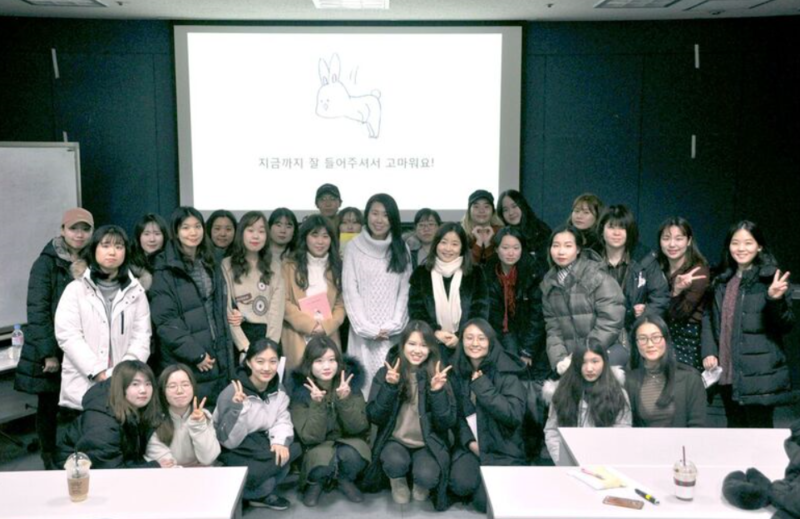 On January 29, special lecture with Author Gu was held on the second foundation campus B109 under the organizer of Support Center for Student with Disabilities. Author Gu, Korea rabbit character BENNY’s illustrator, gave a lecture on her own story of following her artistic dreams from a swamp of various hardships. Although lots of suffering such as auditory difficulties, prejudices, and Retinitis Pigmentosa made her despair, her courage as “I can do it ‘too!’” was sent to students who filled the entire lecture room. Kim Min Young, School of Communications & Media ‘17, gave her thoughts like “It was a time that came to me with a truly touching mind. Even though there wasn’t any special word, her life story encouraged me.” Because of the sparked attention, the lecture took a time more than expectation. After an hour of her speech, there was a free question and answer time between Author Gu and the students. Lecture also had a group photo session and a book signing session on the spot. Kim Joo Young, team leader of Support Center for Students with Disabilities, closed the lecture with closing address as “This is a lecture for not just education for the improvement of the handicapped, but also finding student’s own way through Author Gu’s story.” BENNY, celebrated its 10th birthday as of 2017, is the character which was born with Author Gu’s wish to hear the sound well with its big ears instead of her.